What's your biggest challenge managing payroll? Check the level of payroll support you're interested in. Thank you for your interest in our payroll service. We will contact you within one business day to help you select the perfect fit and get set up for your business. With Bookkeepers Plus on your side, payroll is simple. Discover how our easy-to-use, low-cost payroll solutions let you securely manage payroll from the office or on the road. Keeping payroll separate from your QuickBooks helps you protect employee and salary information. Bookkeepers Plus offer two payroll service options for businesses that do not want to run payroll through their own QuickBooks file. With each option, you get the training and support you need, plus peace of mind knowing that your payroll is done right. With Bookkeepers Plus Hosted Payroll, we take care of it all. You provide payroll information and we take care of processing payroll and manage all tax liabilities and filings. Bookkeepers Plus will send you payroll summary reports and general journal entries to import into your QuickBooks. Or manage it all yourself with our Intuit Online Payroll from Bookkeepers Plus. You can manage your payroll from anywhere, or anytime. All you need is an internet connection. General journal entries are downloaded into your QuickBooks. You can manage tax liabilities and filings yourself, or outsource them to Bookkeepers Plus. 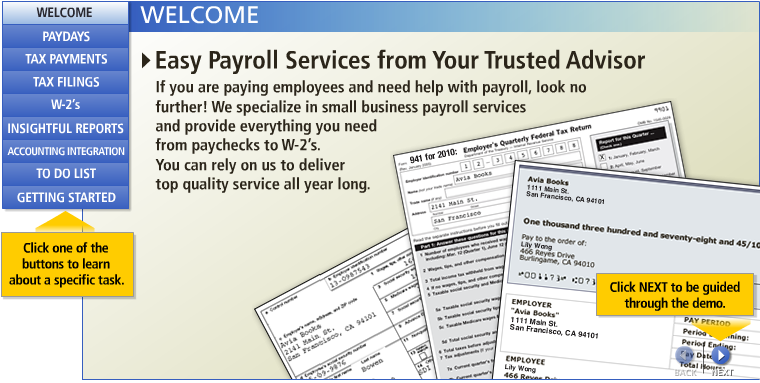 Our tailored payroll solutions make it easier than ever! Confidently manage tax liabilities - no more missed deadlines! Watch the video demo to learn more! Click to watch our video and see how easy payroll can be! Contact us for more information or to schedule a free 30-minute consultation to review your bookkeeping and accounting needs.